Renegade general Laurent Nkunda says his rebel forces are abandoning a U.N.-mediated ceasefire with the Congolese government. Congo's defense minister says the government wants to use dialogue to solve the crisis in eastern DRC, but rebel forces say they have been repeatedly attacked by army troops in recent days. Selah Hennessy reports from the VOA West and Central Africa bureau in Dakar. "From yesterday we have decided to attack them on all the sides: to North Kivu and South Kivu and Oturi," said Bwambale Kakolele, an ally of renegade general Laurent Nkunda. He says fighting continues in several places in North Kivu. The U.N. mediated a ceasefire between warring army and rebel troops at the beginning of September. But Kakolele accuses the army of continuing attacks despite the ceasefire. Now, he says, his men are going on the offensive. "We cannot accept every day to attack us and we still quiet," said Kakolele. "It is not good." Army officials say more than 70 rebels have been killed in a series of battles that started Thursday. Kakolele says his men are protecting ethnic Tutsis against attacks by ethnic-Hutu rebels from Rwanda, known as FDLR. Kakolele accuses the government of allying with the FDLR. He says his men will not stop fighting until the Hutu combatants are ousted. "We are going to make guerrilla warfare for [the Hutus] because we want to finish their military forces, we want to finish them," said Kakolele. Congo's defense minister Chikez Diemu says fighting restarted because Nkunda's men were smuggling weapons into Congo, near the border with Rwanda. "When he attacks people, of course we attack as a reaction, but we do not have a national policy to attack him," said Diemu. He says his government is working with Rwanda, Burundi, and Uganda to bring peace to the east and to disarm and repatriate the FDLR. "Four states that have met, we committed all of us to say what should we do with negative forces, what should we do with refugees, what should we do for development and peace," said the defense minister. 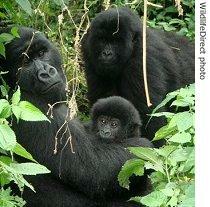 Fighting spread Saturday to Virunga National Park, home of endangered Congolese mountain gorillas. Animal welfare charity Wildlife Direct said park rangers had to flee because Nkunda's men were trying to forcibly recruit them to their ranks. Wildlife Direct spokeswoman Samantha Newport told reporters that the gorillas are now unprotected and extremely vulnerable. Only 700 of the endangered gorillas are left in the wild, 10 are known to have been killed and two are missing from the park since January.